Pick a card, any card! Put your message and your brand directly in the hands of others - literally! 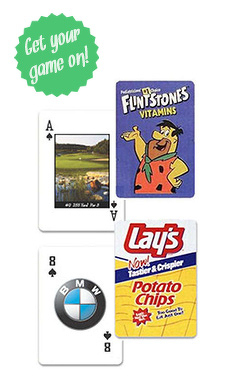 Be the CEO of your event when you show up with Executive Style Playing Cards.You can have your printed playing cards customized in every order to offer you truly one of a kind hand of playing cards. Imprinted on premium heavyweight bright white paper to ensure every hand dealt goes flawless. These custom cards are even plastic coated and available in either smooth or linen finish to offer that Vegas like feel with the perfect snap. Take advantage of free artwork from our in-house design lab standing by waiting to draw up unique artwork for you for us to print on these 52 beauties. With unbeatable prices and low order quantities, you can afford to deal these out at the next company event or organization fundraiser. At these prices you can give them to all your distinguish members for their years of service at the retirement party.